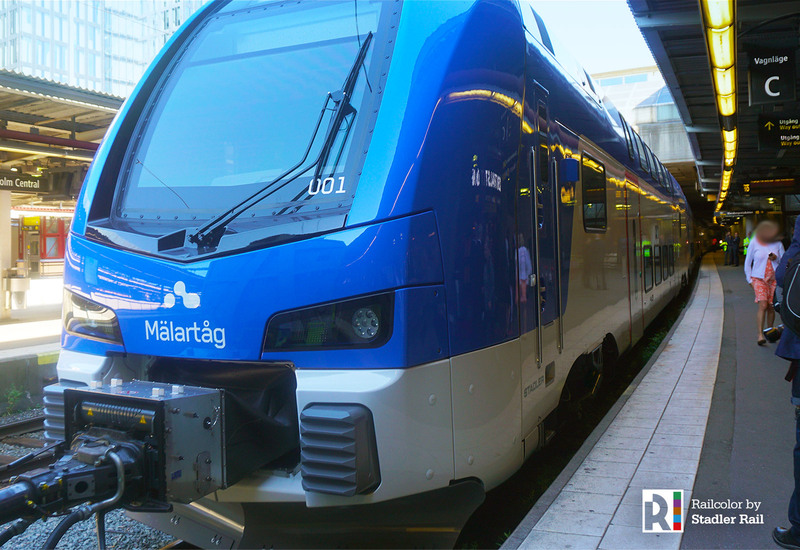 On June 27, the first Mälartåg (Mälar train) from Stadler is on show at Stockholm Central Station in cooperation with Mälab and Transitio. The train is a variant of Stadler’s DOSTO doubledeck train and is going to run in the Mälardalen region from 2019. Stadler’s trains are well equipped for Nordic winter conditions and maintain a high standard for Swedish travellers. The train is being put on show at Stockholm Central Station for media and invited guests, and is the first of the 33 new double-decker trains Transitio, commissioned by Mälab, ordered from Stadler. The model is called DOSTO and is already operating in Switzerland, Austria, Germany, Luxembourg, Russia, Georgia, Azerbaijan and has also been sold to the USA. The trains share technology with the FLIRT trains used by Norwegian NSB, Finnish VR and Swedish MTR Express. They are designed to run at minus 40 degrees and with a depth of 800 mm of snow on the track. Some examples of the design solutions incorporated to withstand the extreme weather conditions are inter-carriage connections with twin bellows, large snow ploughs, efficient floor and wall heating systems and specially adapted insulation. The underframes of the trains have been designed to minimise freezing. Stadler, which both manufactures and services trains, has grown rapidly in the Nordic countries in a short period of time. The company sees continued high growth potential that it is now preparing to meet. By 2020, more than 300 Stadler-produced railway vehicles are expected to run on Nordic railway lines, which is almost 400 percent growth from 2013. In Sweden Stadler runs two workshops with 190 employees in Hagalund and Tillberga, where in the latter the SJ X2000 X31 fleet is currently being technically refurbished in cooperation with ABB. Since 2017, Stadler is also a member of Swedtrain. The DOSTO adaptation for the Mälardalen lines and Transitio, in addition to comfort levels and interior design, makes the train more flexible and able to cope with the Swedish load profile. Further, the extensive adjustments for winter durability minimize damage from collisions with wildlife. The new train carriages will be designed using MÄLAB’s future Mälartågen brand, and have a length of around 105 meters with a top speed of 200 km/h. The interior is designed for commuter and daily travel with travel times around one to two hours, with comfortable adjustable chairs with work tables, power outlets, WIFI and more. The passenger flexibility is superb with folding chairs and possibility of carrying larger luggage and bicycles, and 357 fixed seats per train including folding chairs. There are three toilets, one of which is adapted for passengers with special needs. The driver’s cabin is European (EUROCAB) with cab doors.